Some of our awesome crew and cast: Nyarru, our Assistant Director Noni Eather, Director Katrina Channells, Photographer Rhett Wyman, Cinematographer Michael Beets, Producer Bridget O’Shea, Production Assistant Bree Wild, Storyteller Vikki Parsley, Bimi. We were thrilled to work with Yuin Nation storytellers on an immersive 360° virtual reality project in 2018. This project was funded by the NSW Office of Environment and Heritage, under its ‘Heritage Near Me’ funding program. This program recognises the importance of activating local heritage spaces and precincts to conserve their historical and cultural significance. We’re producing a series of Virtual Reality experiences featuring four local Indigenous storytellers that capture the heart of the landscape, the people and the heritage sites of the Shoalhaven region on the south coast of NSW. We’ve spent the last few months working with Noel Webster, Auntie Christine Blakeney, Vikki Parsley and Vic Channell. It was an honour to hear their stories and to produce them into 360° experiences. We also ran a Virtual Reality training program for some creative and talented students from the region, where we partnered with the students to film and produce their own short virtual reality experience. We were blown away by their potential as filmmakers. We’re excited to announce our campaign for Melbourne University’s Faculty of Fine Arts and Music (formerly Victorian College of the Arts) is due to be released in cinemas across Victoria. After screening at the 2018 Melbourne Film Festival earlier this year, we are thrilled the campaign will once again be on the big screen! We thoroughly enjoyed working with the Faculty of Fine Arts and Music on the films, which feature profiles of three of the University’s most established and influential alumni. Each subject was fantastic to work with and provided incredible insight into their respective fields within the Arts. The campaign features the world renowned artist Patricia Piccinini; Associate Conductor of the Melbourne Symphony Orchestra Benjamin Northey; and head of the Wilin Centre Richard Frankland. Each share their fascinating individual stories and it was a pleasure to get to know them all. We’re well into production on a campaign for The Bridge, a long-time client of ours. After the success of our last campaign, we’ve been working closely this year with The Bridge Employment and The Bridge Connects to deliver a new series of inspiring stories. The Bridge participant and photographer, Hassan. The Bridge works tirelessly to support a diverse range of people experiencing disadvantage. We’ve recently been filming in the south-eastern suburbs to capture how, with a helping hand, these people have achieved their goals. We’re profiling an inspiring range of people such as: a press photographer from Pakistan aiming to enter the media industry in Melbourne; a young woman who achieved her goal to gain employment at a local chemist; and a support worker and client with a lovely friendship who have been working together for over a decade. We’re excited to move this project into post-production and even more so to share the finished product with everyone. Stay tuned. 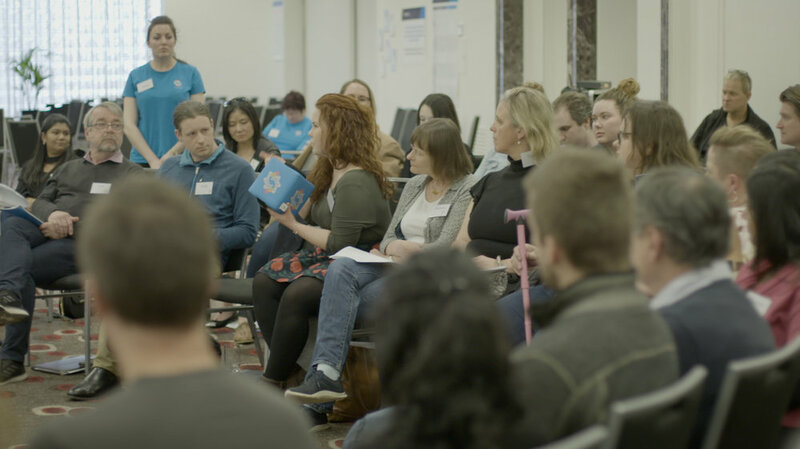 We recently partnered with the Department of Health and Human Services and Mosaic Lab to film the Victorian Gender Equality Citizens’ Jury. The jury was composed of a representative selection of Victorians who came together in Melbourne across two days. They deliberated on how to best meet the goals of the recent Victorian Government’s Gender Equality Bill. The aim of the Act is to enshrine gender equality in law and it proposes that the public sector and all local governments in Victoria work to achieve this through quotas, action plans and reporting. The Citizen’s Jury was a critical event in allowing all Victorians to have their say. We were proud to capture the constructive debate, positive energy and success of the event. As a company founded by two women we are thrilled that this positive step has been taken towards gender equality. We’re excited to finalise this project in post production and share the finished product before the Bill is introduced in parliament in March next year. Education Services Australia (ESA) works collaboratively in the interests of all Australian educators and provides digital teaching and learning resources. For the last few months we’ve been working alongside ESA to develop films that will help implement the important Respectful Relationships program. Schools play a crucial role in creating a culture of respect and equality and Respectful Relationships works to change harmful behaviours by actively engaging and promoting these cultures in the schoolyard and classroom. We’re excited to be working alongside such a worthwhile program and are pleased to be producing films that can encourage this change. We have been busy this month continuing production of our series featuring the Artificial Reef Project off the coast of Portarlington, Victoria. Working alongside The City of Greater Geelong and the National Centre for Coasts and Climate (NCCC), we’ve been capturing the awe-inspiring journey of manufacturers, researchers, community members and labourers to position 100+ steel cages along the bay floor. Filled with organic matter such as scallop and mussel shells sourced from the local area, the cages will act as a protector to what before was an increasingly deteriorating coastline. Our team has captured this battle against coastal climate change from sea and sky, using drones and underwater photography to document this innovative project. We can’t wait to move this project into post production and begin finalising the series. It’s such a pleasure to be working alongside environmentally conscious and proactive organisations and people. In particular, we’d like to thank NCCC’s Stephen Swearer and Rebecca Morris, as well as Ralph Roob of the City of Greater Geelong.